- 100% cotton Pin Up Shirt Zombie Hot Rod Wear Tee is comfortable, durable, and preshrunk. 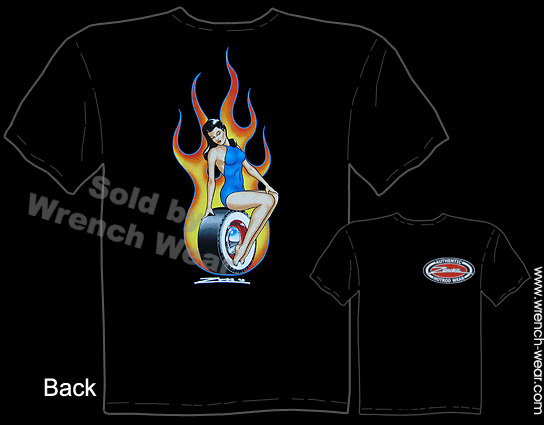 - Silk screen artwork on this Flaming Trophy Girl Hot Rod T Shirt for detail and longevity. - Pin Up Shirt Zombie Hot Rod Wear Tee design is on BACK. Small design on chest. - Color of Flaming Trophy Girl Hot Rod T Shirt is BLACK. - Buy American... Pin Up Shirt Zombie Hot Rod Wear Tee is printed in the U.S.
- Flaming Trophy Girl Hot Rod T Shirt brand varies... Hanes, Gilden, Fruit Of The Loom. - New Pin Up Shirt Zombie Hot Rod Wear Tee arrives folded and bagged. This Pin Up Shirt Zombie Hot Rod Wear Tee makes the perfect gift for the Flaming Trophy Girl Hot Rod T Shirt enthusiast you know. Wear it yourself to display your interest in Pin Up Shirt Zombie Hot Rod Wear Tees. High quality 100% cotton Flaming Trophy Girl Hot Rod T Shirt is preshrunk, durable, and comfortable. Silk screened artwork on the Pin Up Shirt Zombie Hot Rod Wear Tee has great detail and is long lasting. Increase longevity of this Flaming Trophy Girl Hot Rod T Shirt further by turning inside-out before machine washing and tumble drying. Design is on the BACK of the Pin Up Shirt Zombie Hot Rod Wear Tee. Small design on front. Shirt color for this Flaming Trophy Girl Hot Rod T Shirt is BLACK. Licensed Pin Up Shirt Zombie Hot Rod Wear Tee is printed in USA. Brand of the Flaming Trophy Girl Hot Rod T Shirt varies... Hanes, Gilden, Fruit Of The Loom. Pin Up Shirt Zombie Hot Rod Wear Tee is delivered folded and bagged. Refer to the size chart on this page to choose the correct size Flaming Trophy Girl Hot Rod T Shirt. See our other Pin Up Shirt Zombie Hot Rod Wear Tees here. Shopping results for Flaming Trophy Girl Hot Rod T Shirt. All of the Pin Up Shirt Zombie Hot Rod Wear Tee designs are owned and licensed by their respective owners, subsidiaries, affiliates or licensors. The marks appearing on this website including, but not limited to: Ford Oval and Ford nameplates, Mercury, and their respective logos, emblems, slogans and vehicle model names and body designs are trademarks and/or service marks of are registered trademarks owned and licensed by Ford Motor Company. GM and the GM Logo; Chevrolet, Pontiac, Oldsmobile, Buick and their respective logos, emblems, slogans and vehicle model names and body designs are trademarks and/or service marks of GM, its subsidiaries, affiliates or licensors. DaimlerChrysler and the Chrysler Logo; Hemi, Cuda, Daytona, GTX, Dodge, and Plymouth and their respective logos, emblems, slogans and vehicle model names and body designs are trademarks and/or service marks of DaimlerChrysler Corporation, its subsidiaries, affiliates or licensors. ACME Speed Shop, Pepsi, Rat Fink, Ed Roth, Ed Roth Designs, Willys registered trademarks owned and licensed by their respective subsidiaries, affiliates or licensors. Copyright © Wrench Wear. All Rights Reserved.